A single page from Color Along Variety Book Volume 11. Watch the live COLOR-ALONG tutorial for this page on Anne Manera’s Facebook page by clicking here. A COLOR-ALONG with Anne Manera is free to watch. Pages being colored during each live video, with replays available at your leisure, can be found in Anne’s Color Along Variety Coloring Books. Click here to watch the video . 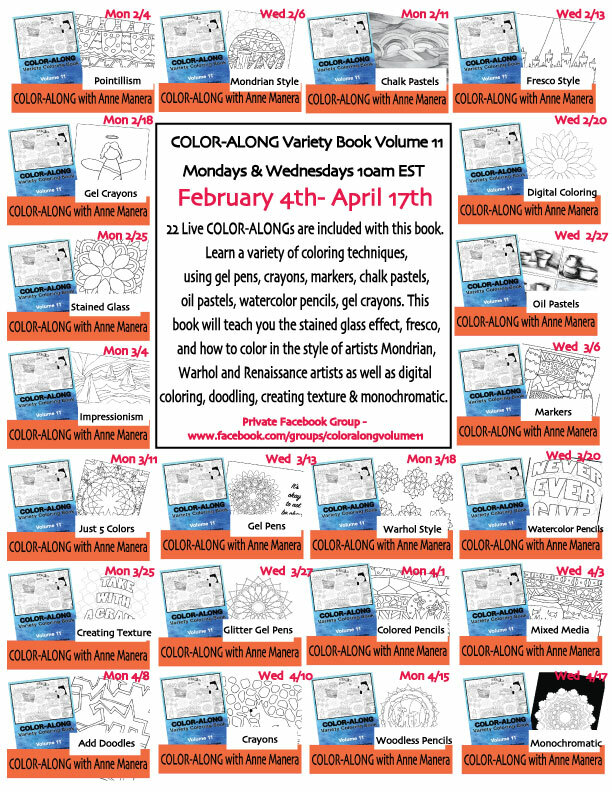 When you purchase Color Along Variety Coloring Book Volume 11 also have access to a Private Facebook Group which will have more info on famous artists, art genres and coloring techniques for each live COLOR -ALONG. You can purchase Color Along Variety Coloring Book on Amazon or Buy the PDF on Anne’s Website. This download is intended for personal use only and may not be distributed or sold in any way. ©Anne Manera 2018. All rights reserved.